I’m going back to a time long long ago!!! Do you remember the candy Now and Later? They were so good! I didn’t know that they were still around. I’m sorry (not really) for posting this photo, because you may go out and buy some NOW after reading this. NOW and LATER!!! The candy that could be enjoyed now and later (I guess). I always liked the name. Now, why am I talking about this candy? There’s a sermon everywhere. Or in this case, there’s a blog post everywhere. Hopefully, our goal when it comes to our health is that we can enjoy it “Now and Later!” Hopefully we are enjoying right NOW the energy, strength, and confidence that our health and exercise provide for us. Hopefully we are exercising and taking good care of our bodies NOW, so we can be healthy LATER! But who is to say that you will have LATER? No one knows how long they will have! What’s your mentality? NOW and LATER or NOW or LATER? I recognize that even if we have our health NOW that things could change LATER. But we’re better off being in shape NOW to at least have a chance LATER! Sadly, many have the same mentality when it comes to Jesus! People have the opportunity to have a relationship with Jesus NOW and LATER in Heaven. But many have the mindset of, “I don’t have time for Jesus NOW! I will worry about that salvation stuff LATER.” But who is to say that you have LATER? Many reject believing in Jesus NOW! But if you decide to reject Him NOW, you will still believe in Him LATER when He returns. All will see Him! Many refuse to repent NOW, but LATER they will wish they had. Many refuse to be baptized in water for the forgiveness of sins NOW to receive Gods saving grace. Sadly, many who refused Gods amazing grace will be immersed in eternal darkness, separated from Gods presence in hell LATER. (That last statement is not popular or politically correct, but it is Biblically correct). 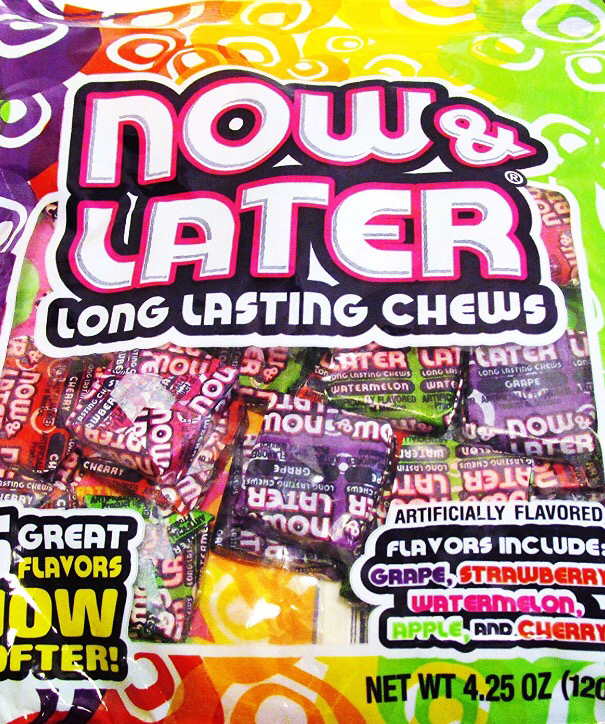 NOW and LATER…It’s a great candy. NOW and LATER…It’s a great mindset to have when it comes to staying healthy. NOW and LATER…It’s a great mindset to have with respect to following Jesus.